In the work of Amanda Ross-Ho, bigger is not necessarily better. Her exhibition ‘A Stack of Black Pants’ is packed with images, objects and interventions, some of it grand in scale and some nearly invisible. One of the show’s pivotal pieces isn’t even acknowledged in the list of works: it consists of five tiny pieces of haberdashery – a zipper, an earring, a couple of unidentified bits of jewellery and a gold heart – fixed directly to the wall. Between them, a ruled pencil line connects one to the other; all roads, however, lead to the heart, which is positioned to one side. It looks like a symbolic diagram. The pleasurable problem of ‘A Stack of Black Pants’ concerns the tightness of the formal and conceptual connections between its parts, and where we subsequently locate Ross-Ho herself in all of this. Near to the work mentioned above is another wall-drawing, this time smudged and with most of its nodes removed (only pinholes remain). ‘SINCERELY SINCERELY’ reads a scrawled note, to one side. Is this a mantra or simply a jotted reminder? The largest works in the exhibition are six white canvases with red calligraphic marks on them. They look like blown up shopping lists or indecipherable ‘notes to self’; titles such as CORRECTION #19 (23%) or CORRECTION # (CCCC) hint that these are pieces of schoolwork, with everything but the teacher’s marking erased. The dates of the paintings, given as 1981–2010, hint that the student may have been the 35 year-old artist. TRIANGLES AND TEAK REAMS (2010) comprises oversized, red acrylic geometry triangles and blocks of wood cut to the dimensions of a stack of US letter paper, arranged alongside a female mugshot cut from a newspaper and a jack o’ lantern pendant. Empirical evaluation seems threatened in both works by chaos, breakdown and the loss of self. At first glance however, the exhibition coheres tidily. The colour red recurs in diverse works throughout, linking flagons of Carlo Rossi Blush wine to red Van’s sneakers and a strawberry pin-cushion. Even the cut-up press release (collaged from previous exhibitions) is colour-coordinated. It is hard to shake the sense that this neatness is somehow too controlled, even slightly pleased with itself. 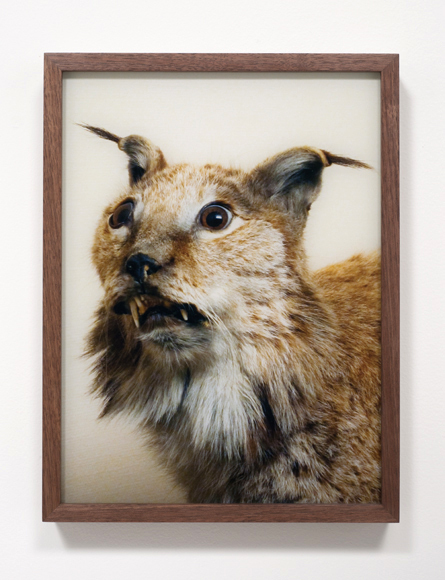 It was where sense broke down that the work opened up: Tragedy (2010), a photograph of an egregiously taxidermied bobcat, hung opposite an enlarged advertisement for BROWN COCONUTS (2010). I have no idea why, but in their evasiveness they hinted at something specific or private to the artist. The work that gives the exhibition its title is pretty much what you’d expect, except that the pants in question had been meticulously rescaled to 300%. If the originals belonged to Ross-Ho, as seems likely, the work is a close-fitting metaphor for the way in which the artist’s identity moves within the expanded forms of her deceptively casual practice.